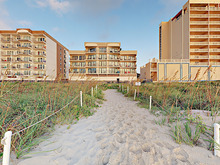 Direct beach access is the highlight of this 2BR/2BA condo. Conveniences include reserved parking and elevator access. Sleep up to six with a sleeper sofa in the open-concept living area. Both spacious bedrooms feature a private en-suite bath. Lounge around the shared outdoor pool and hot tub. Walk directly from the poolside to the Gulf shore, bringing along the beach umbrella and chairs provided for guests. Enjoy morning coffee on your private balcony, and then head out for breakfast at one of several nearby restaurants. Get active with a lesson at Air Padre Kiteboarding, or spend an afternoon at Schlitterbahn Water Park. This condo is great for a couples’ getaway or small family vacation. The open-concept space is kept cool and comfortable with central air. In the living area, host a movie night—choose one from the DVD collection and watch it on the 32” TV. The full kitchen provides everything you’ll need to cook and eat in. Gather for meals at the dining table for four; there are also two bar stools at the counter—ideal for a quick breakfast or snack. Guests staying in the king-size master bedroom will enjoy direct balcony access, a 32” TV, and an en-suite bath. The queen-size guest room features a 21” TV and an en-suite bath. Both bathrooms have a tub/shower configuration. Sleep an additional two guests on the sleeper sofa—they will enjoy waking up to natural sunlight streaming through the sliding glass balcony doors. Reserved parking for one vehicle is included. Direct beach access is mere steps from your South Padre Island condo. Restaurants and bars are within walking distance (less than a mile). Head to World Flavors Coffee House or Groovi Smoothi for a quick and easy breakfast before enjoying local outdoor activities, like a kiteboarding lesson or a trip to Schlitterbahn Water Park (10 minutes).